Marquee Nightclub Las Vegas is the #3 top nightclub in Vegas that cost 60 million dollars to build. It was designed by the David Rockwell Group, and is owned and operated by the Tao Group. The venue is 62,000 square feet in total. It’s 40,000 square feet is on the inside with 60 foot ceilings, and 22,000 square feet on the outside dayclub, with a 22,000 square foot dome during the fall and winter time. There are 3 levels, with 5 bars, 2 outdoor pools, and holds a 5,000 person capacity. There are 164 VIP locations for bottle service in total, with 83 tables found on the inside the at the Main Club Floor, Boombox, Library, and Salon areas. There are an additional 81 VIP locations for bottle service in the day club pool area that consist of Grand Cabanas, Cabanas, Bungalows, Day beds, and Day Couches that are enclosed by glass windows that overlook the Las Vegas strip. Marquee Nightclub Las Vegas is a top nightclub in Vegas that was designed for a smooth assimilation of the audio, visual, lighting, and performance features by collaborating with venues architectural structure, while combining art and film production where designers and DJs can integrate their own video production material. This venue has pretty much anything and everything you could want out of a nightclub. When is Marquee Las Vegas Nightclub open? Operating hours at this top nightclub in Vegas are open Friday, Saturday, and Monday from 10PM to 5AM. The dayclub is open daily year round from 10PM to 5PM and then reopens at 10PM on Friday, Saturday, and Monday. Where is Marquee Nightclub Las Vegas located? The location of this top nightclub in Vegas is on the 2nd floor of The Cosmopolitan Hotel and Casino. If you enter from the strip, you can take the elevator at the Chandelier Bar from the 1st floor up to the 2nd floor where you are immediately greeted by several velvet red rope entrances that create separate lines for table reservations, presale tickets, guest list, general admission, and ladies only. You will be guided by either the security guards or door hosts to the elevators that you will ride up to the 17th floor. 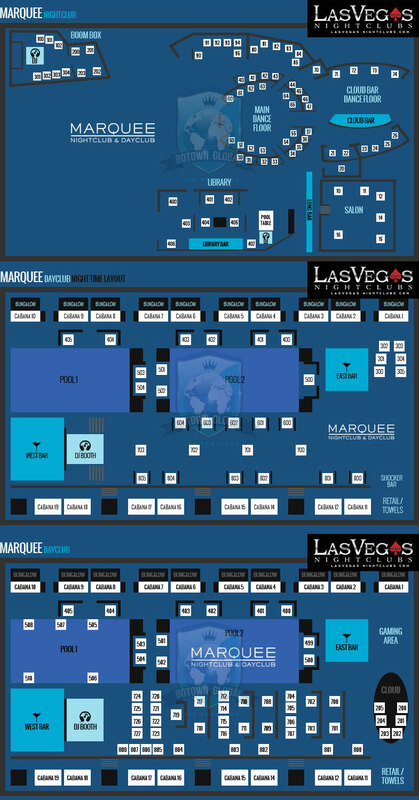 If you are coming in from the skywalk entrance doors on the 2nd floor from the strip, you will walk straight past the chandler, and past the escalator where you will end up at Marquee will be on your left. How much is cover charge at Marquee Nightclub Las Vegas? Cover charge at this top nightclub in Vegas fluctuates a little. Depending on the DJ performing, the cover charge for general admission for men is $30 to $60, and for women its $20 to $40. During special events and holidays such as fight weekend, Memorial Day, Labor Day, and EDC week, general admission can reach as high as $60 to $100 per person. It might be a good idea to purchase presale tickets to save a little money. To get in the Dayclub it usually costs about $20 for girls and $40 for guys unless you are staying at the Cosmopolitan, or are on the guest list. How long do I have to wait in line at Marquee Las Vegas Nightclub? The line wait at this top nightclub in Vegas really depends on the line you are standing in to determine how long it will take to get in. There are general admission, female guest list, presale ticket, and bottle service lines. Fridays and Saturdays it takes anywhere from 45 minutes to 2 hours on the busiest nights to get inside. Monday nights can take anywhere from 20 to 1 hour to get inside. It would be a good idea to arrive around10:30 PM. What is the dress code at Marquee Nightclub Las Vegas? Dress code at this top nightclub in Vegas is more strict than others. It’s advisable that you arrive in dress to impress type clothing such as collared shits, and nice dress shoes. If your shirt isn’t so nice we suggest you wear a sports jacket. You will not be allowed in with tennis shoes, sportswear, or excessively baggy clothing. Jeans are permitted, but they should not have holes in them. Do not wear hats, and forget about sleeveless jerseys and tank tops. This nightclub has some of strictest dress code policies you will find anywhere in Las Vegas. What type of music do they play at Marquee Nightclub Las Vegas? Music genres at this top nightclub in Vegas include EDM and Hip Hop music. There are 4 areas for dancing that include the Main Club Floor (EDM), The Library (lounge music), Boom Box Lounge (hip hop), and the dayclub dance floor (EDM/Hip Hop) area in front of the DJ booth at the pool. Who are the resident DJs at Marquee Nightclub Las Vegas? Resident DJs at this top nightclub in Vegas 2016 lineup of resident DJs at Marquee include Carnage, Cash Cash, Cedric Gervais, Dash Berlin, Galantis, Porter Robinson, Poliotik, Tritonal, and Vice. Past resident DJs from 2010 to 2015 include Audien, Andrew Rayel, Benny Benassi, Borgore, Kennedy Jones, Shane 54, Kaskade, Cosmic Gate, Eric D-Lux, Armin Van Buuren, Lema, Lisa Pittman, Roger Sanchez, Benny Benassi, Jordan Stevens, ATB, Chuckie, Erick Morillo, Gareth Emery, and Markus Schulz. How much money does Marquee Nightclub Las Vegas make? This top nightclub in Vegas and was ranked #1 in the US in 2012 by “Nightclub and Bar Top 100”, generating between $70 million and $80 million in revenue its first year in business. In 2013 it was ranked #2, generating $80 million to $90 million. In 2014 it was ranked #2 generating $85 million to $95 million, and in 2015 it was ranked #3 generating $80 million to $85 million in revenue. 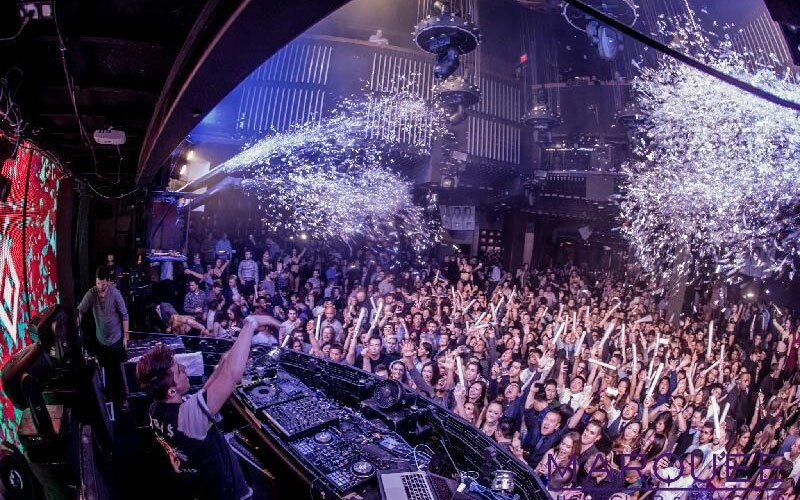 Who were the audio, video, and lighting designers at Marquee Nightclub Las Vegas? 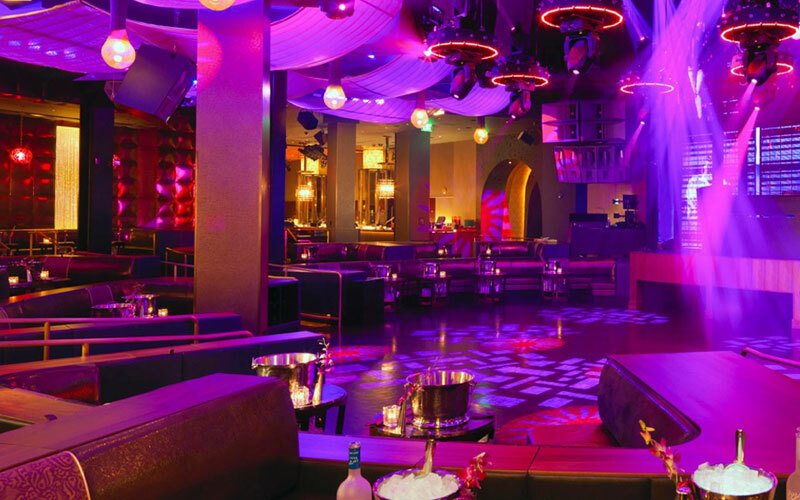 The Production team at this top nightclub in Vegas consisted of veteran lighting designer Steve Lieberman of SJ Lighting, as the lighting consultant original theatrical lighting design consultant, and was also the consultant during the $5 Million Dollar lighting, stage, audio, visual redesign. Stage design and lighting architecture was done by Jules Fister, CEO of Third Eye, Fisher Dachs Associates (FDA), and Fisher Marantz Stone (FMS). Jules used his companies Third Eye and Fisher Dachs Associates to install the side lighting and lighting effects, scrims, and video elements. 4Wall Entertainment implemented the lighting fixtures. The Audio and video content development was done by Sonoma Systems, Corso Communication, and V Squared Labs that included directors Vello Virkhaus and Emilio Sa. Stage machinery and drawbridge was engineered by Show Motion, owned by Bill Mensching. Stage machinery and design supervision was done by project manager Alec Stoll of Fisher Dachs Associates. Lighting infrastructure was handled by Micah Rahn of Fisher Dachs Associates, and AG Lighting installed the dome over the day club. 4Wall Entertainment of Las Vegas was hired data and power distribution, along with distribution of data and lighting integration. What is the Main Club Dance Floor at Marquee Nightclub Las Vegas? This top nightclub in Vegas has amazing stages and dance floor lighting. The stage in main club has 3 levels for performing, along with a $3 million dollar LED DJ booth that is elevated 5 above the dance floor that extends 40 ft. high. The DJ controls everything from a mounted Apple Ipad that features multiple effects such as custom audio & visuals like air horns, sirens, blackouts, video intros, sparkle showers, cryogenics, and explosions with a touch of a button. There is an 8 ft. thrust, and 3 retractable scrims. There is a 20 ft. wide center scrim, and a pair of 9 ft. scrims on either side. There is a multi-layered LED wall in back of the stage that is 32 ft. by 29 ft. along with a folding video drawbridge with LED’s that performers use to perform above DJ booth. There are 20k and 12k lumen projections that encompass the Main Club dance floor. The video system is controlled by a customized VJFX system that allows you to blends video cues in real time, along with multiple Hippotizer HD video servers, and Modul8 video servers. The dancefloor is shaped like a trapezoid, and has moveable light pods that dangle over the dance floor. There is coliseum-like seating that surround the edge of the dance floor. There is a 4 ft. disco ball is enclosed by strips of metal hangs from the ceiling above the dance floor and features Birket LED strobes. What type of lighting does Marquee Nightclub Las Vegas have? 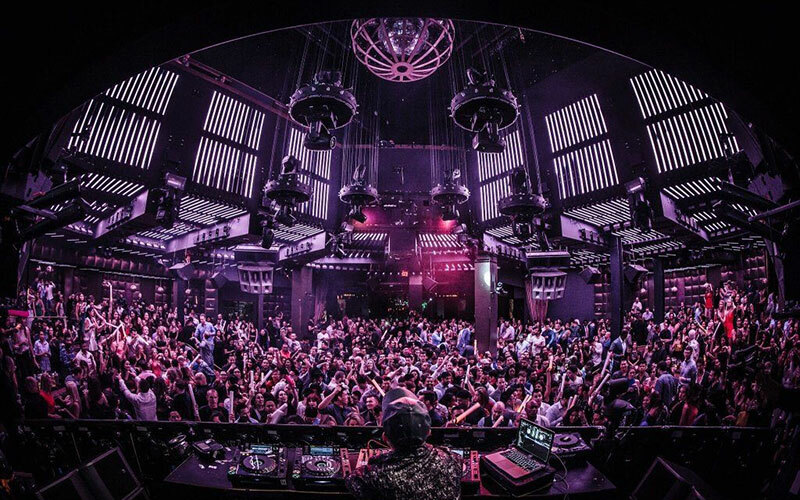 Lighting at this top nightclub in Vegas was upgraded 14 different lighting zones after a few years to keep up with the competition so the club underwent LED lighting upgrade in 2014 took 9 months to complete. Steve Lieberman of SJ Lighting was once again the lighting consultant who worked closely with the designers at Sennova Systems, V Squared Labs, FDA, and Third Eye. 4Wall Entertainment was responsible for system integration and supplied the ETC Connect Selador Classic fixtures. The upgrade switched out the white ceiling sails and then vertically installed 1,100 Pixel Bar 40s LED Strip lights, and RGB LED strip lights on the ceiling and walls to create an amazing 360 degree effect. The Pixel bar 40’s is controlled by Madrix controller with 252 universes, and is regulated by 100 Pixel Net 4 drivers + Artnet, and uses RJ45 CAT5e ports to accentuate the coffers, and beam lines. The main lighting rig is comprised of 336 ETC Connect Sensors + Dimmers, 120 ETC SmartSwitch Relay Pannels, 8 ETC Connect Paradigm Architectural Control Processors, ETC Connect Net3 Four Port DMX Gateways, and DMX Splitters by Doug Fleenor. Design. They also installed a lasers, and 2 Kryogenifex Liquid Nitrogen systems. Slow motion designed 6 light pods over the dance floor that is hooked up to automated trusses by spider cables. The pods have 2 Elation Spot 300 Pro fixtures that have 6 inch Philips Color iColor Coves. The lighting equipment in the main room is controlled by MA Lighting GrandMA2 lighting console that links back to the Rack Room on the 4th floor. The Rack Room contains a Green Hippo Hippotizer HD media server, 2 Apple Mac Pro towers, HP Z800 with Derivative TouchDesigner software, 4 Barco Folsom DCS 100 with Modul8 VJ software wired up to 4 video zones, 2 drapes, the LED wall, and scrims. What type of video does Marquee Nightclub Las Vegas have? Video at this top nightclub in Vegas delivers a state-of-the art-visual experience. Senovaa Inc. was the video designers that implemented 30 foot video walls, and curtains that contain with 3d projection mapping. There is a Barco FLM R22+ on 3 stage scrims, and 2 Barco SLM R12+that focus on the left and right curtains in the main club. The visual art development was created by V Squared Labs and Corso Communications. The goal of the visual experience was to create custom visual and audio experience for the resident DJS and so that the dance performers on stage would look transparent and textured while interacting with the content. The visuals in the club can be customized for private corporate events for branding purposes. The video system was designed to be flexible and to supply rich features on all 3 side of the main club. The VJs use iPad and JazzMutant Lemur multi-touch control interfaces for image sequencing, and creating custom visual patterns. The VJ booth has 3 other IPads that can be used for on the spot performance participation. What is the Dayclub in Marquee Nightclub Las Vegas? The Dayclub at this top nightclub in Vegas is an extension of the venue that measures 22,000 square feet. Open year round daily at 10AM, this luxury pool area has 53 VIP tables for bottle service that feature 18 cabanas that include 8 grand cabanas, 10 three story bungalows, and 25 daybeds. There are 2 pools, 2 island bars, and a DJ booth with its own spa. During the fall and winter the venue installs a 22,000 square foot dome to block the wind, making the dayclub pool area more comfortable extension of the nightclub during these times of the year. What is the Boombox Room in Marquee Nightclub Las Vegas? Boombox room in this top nightclub in Vegas is a separate hip hop room that delivers an intimate setting overlooking Harmon Avenue. Located just 1 floor below the Main Club, the Boombox Room has 11 VIP tables with gold leather couches, a bar that’s 360 degrees, dj booth, and dance floor. If you are on a budget these tables are usually not as pricy as other areas VIP sections. What is the Library Bar in Marquee Nightclub Las Vegas? Library bar in this top nightclub in Vegas is a famous element of this venue that is known for it’s plush leather, and wooden furniture. The Library Bar has 11 VIP tables, a long bar with 11 bar stools, and a DJ booth with a DJ playing down tempo lounge music. You can rack up a game of pool on the billiards table, or you can sit comfortably around the fireplace and chat with your friends. Located 1 floor above overlooking the Main Club floor behind the LED screen, this chilled VIP retreat environment has a vintage book collection from New York City’s Stand Bookstore, and makes the perfect spot to rent out for corporate, private events, or any type of small function. What is the Salon in Marquee Nightclub Las Vegas? The Salon in this top nightclub in Vegas has multiple VIP sections. The Salon is a VIP section at Marquee that is located on the Main Club Floor to the far left if you are facing the DJ booth. As you walk past the long bar on the right hand side you will be greeted by a security guard who is monitoring the Salon area. There are 7 VIP tables surrounded by dark leather couches, and rich brown woods that surround that parameter of the tables. Learn about the Marquee guestlist.